Since I’m running larger wheels & tires on my Sprinter, I can’t use the factory spare wheel location anymore. Fortunately, there’s a reasonably priced spare tire carrier for the back door available and the Installation of the Surco TS-100B is pretty easy but requires drilling one hole in one of the rear doors. The picture above shows the installed spare tire carrier on the driver side rear door. I think you should be able to mount it on the other door as well but it makes more sense to have it on the door that you don’t need to open all the time. The carrier has three mounting points, two of them are the existing holes in the hinges while the third point requires drilling a hole in the door. Below are closeup pictures of the mounting points. The carrier attached to the hinges with a simple carriage bolt. To figure out where to drill the hole in the door you temporarily attach the carrier to the upper and lower hinge and mark where the third attachment point is located on the door. One advice about the hinges: You’ll need to replace one of the bolts holding the hinge to the van body. The existing hole in the hinge is actually used to adjust the hinge itself. For that reason one of the bolts at the body is accessible through this hole and it doesn’t have a flat rounded head. 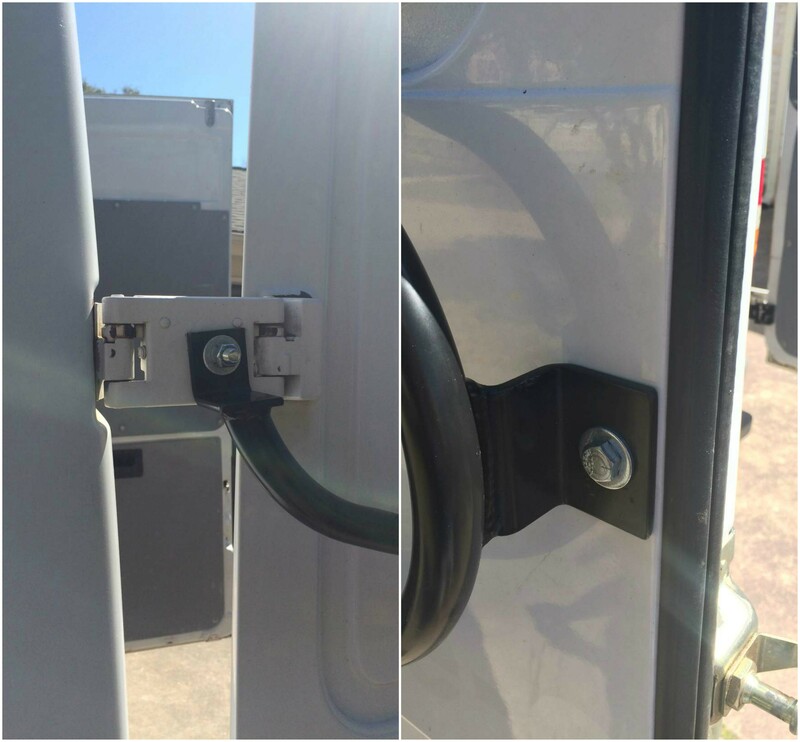 With the carrier installed, the hinge bolt and carriage bolt are a very tight fit and you’ll add stress to the hinge itself. The solution for this is to simply install a different bolt with a flatter head (see the second picture below). After drilling the hole and attaching the third mounting point via a backing plate to the door, you can mount the spare wheel to the carrier. I’m very happy with the final result. I can carry a spare wheel and opening the doors is easy. 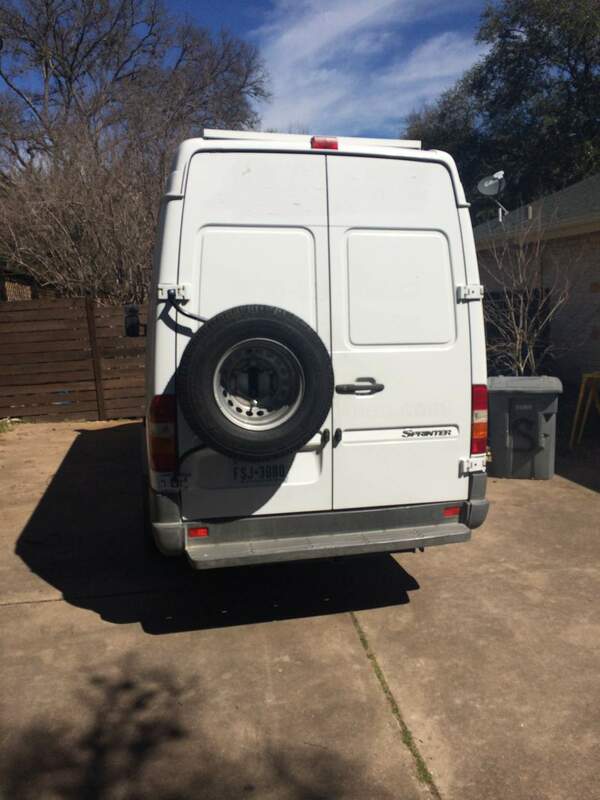 One downside though is that you can’t swing the door with the spare tire carrier fully open (270 degrees) anymore since the carrier would touch the sheet metal of the van. It could actually punch a hole in your van if you’re swinging it wide open. I would also recommend to add another layer of paint to the spare wheel carrier. You’ll see some rust spots after a while if you don’t. I ended up taking it off again and paint it with a few layers of black truck bed paint. Update: Since I published this post I got quite a few emails and comments about something similar for the newer generation (2007+) Sprinters. There’s one available on Amazon which looks like it requires drilling into the door. It’s also twice as much as the one I purchased for the T1N Sprinter. The Brand is the same as mine, Surco. I can’t vouch for the quality of the product or how easy it is to install – so if you have one, please leave a comment. 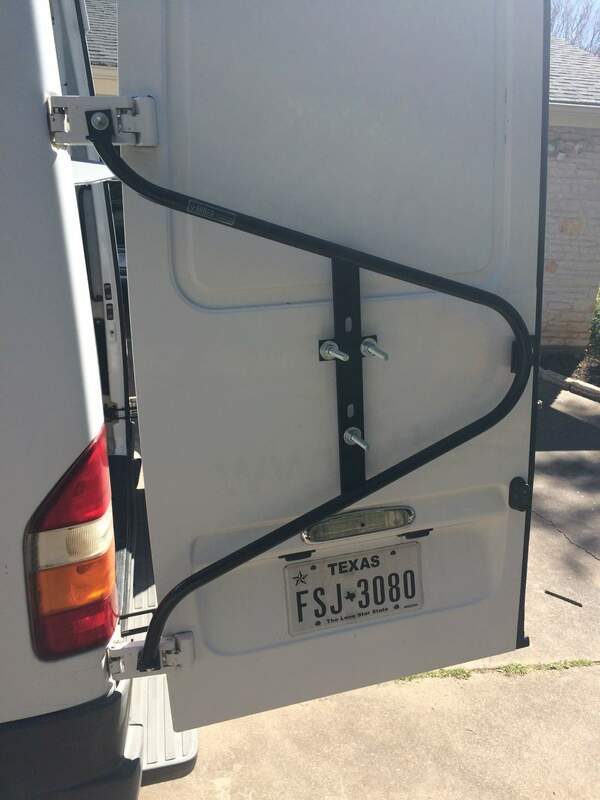 Quite interested in a rack for my 2016 Dodge Promaster rear door. There s NOTHING out there, please help! I need to do the same to my renualt master… do you know of these types of holding device are universal? I am struggling to find one for my renault. Was this a specific one for your sprinter? hi could you tell me if this would do a fait duck van please. Do you know if this will fit a 2017 Sprinter? I don’t think this would fit the newer Sprinter models. I just found two different carriers that fit newer (2007+) sprinter vans. 1) https://amzn.to/2Kffjk4 and 2) https://www.sprinterstore.com/product/sprinter-rear-tire-carrier-ncv3-spare-wheel-carrier-for-2500/. Unfortunately both more expensive than the one I had installed. Nice work! What are the bolts type and diameter you used? I am making my own so I might be using the same specs. Thanks and great tuto btw! Fernando, are the rear doors on your Sprinter RV still the factory Sprinter doors? If yes, the carrier should fit. Otherwise, does that RV have a spare tire carrier in the original location?